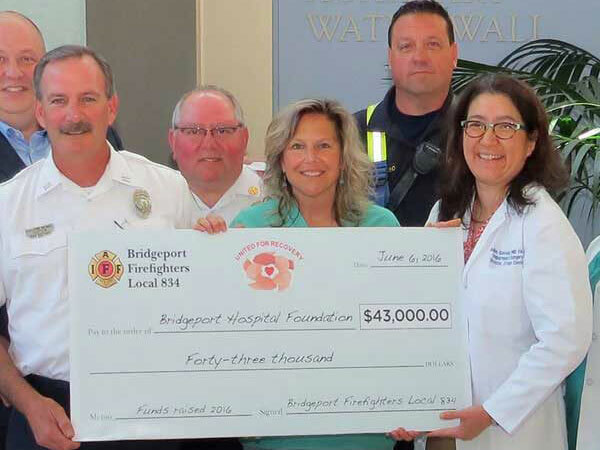 Established in 1973, The Connecticut Burn Center at Bridgeport Hospital is the only dedicated burn care facility in the state. The Connecticut Burn Center is one of our region’s signature medical services with staff and facilities dedicated solely to the treatment of burns. It is one of only 67 burn centers in the United States verified by the American Burn Association and American College of Surgeons. The Burn Center treats more than 200 critically inpatients and receives over 800 outpatient visits each year. The Center recently underwent extensive modernization, including patient rooms and treatment areas and, thanks largely to philanthropic gifts from the community, the addition of an overnight Hospitality Suite for families of patients. The Burn Center is recognized by the American College of Surgeons and the American Burn Association for meeting the most demanding national standards of burn care. If you prefer to mail in your donation, please use this form. I have remembered Bridgeport Hospital in my will, retirement account, or other long-term plans. I would like information on planning a gift in my will or making a life income gift.